I am busy mom who is often pressed for time but I love to bake. Many times I don’t have the extra time needed to make my desserts from scratch. I often resort to box cake mixes and canned frosting to throw together a quick cake or batch of cupcakes. Just the other day I was expecting 15+ guests for a volunteer meeting and did not want to put out the old stand buy but time was of the essence. I put my thinking hat on and spent a few minutes searching Pinterest and came up with this Easy Cupcake Recipe for Apple Cupcakes. The best thing was I didn’t have to run to the store for any ingredients because I had everything I needed. The time needed to prepare these was only a few more minutes than preparing the box mix. So don’t serve the same old cake or cupcakes again spice things up with this Easy Cupcake Recipe. Add Cinnamon Plus and stir in completely. Place cupcake liners in cupcake pans. Fill cupcake liners ½ - ¾ of the way. Place in oven and bake for the time directed on the box. Once cupcake is cool, decorate with canned frosting using a decorator bottle. Sprinkle lightly with cinnamon and serve. My guests were in love with these cupcakes and some have already requested them for our next get together. My friends always say I have the best food when they come over. At Madame Deals we love to share our favorite recipes with you are readers and you can find them all here on our Recipe Page. I used Carmel Apple Frosting for this easy cupcake recipe but you can pick whatever frosting is your favorite. 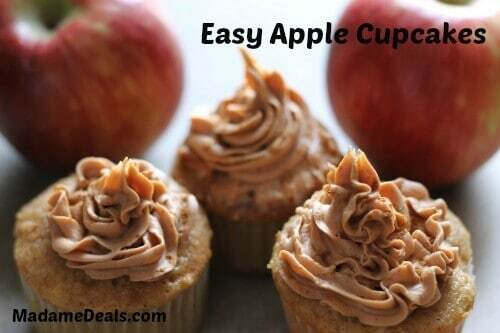 Butterscotch, Cream Cheese, and Peanut Butter would be great flavors to try with these apple cupcakes. Check out our other Easy Cupcake Recipe for Champagne Cupcakes. or our Ice Cream Cone Cupcakes. Do you have an Easy Cupcake Recipe you would like to share? Email us at [email protected] with Easy Cupcake Recipe in the email subject and your recipe could be featured in an upcoming post.